The Volkswagen Touareg of South African driver Giniel De Villers and co-driver Dirk Von Zitzewitz of Germany attends the symbolic start of the Dakar 2010 in Buenos Aires on January 1, 2010. Mechanics works on vehicles early on January 11, 2010 before the 9th stage of the Dakar 2010, between Copiapo and La Serana, Chile. France's Cyril Despres leads the race in moto, Spain's Carlos Sainz in auto, Russia's Vladimir Chagin in trucks and Argentina's Marcos Patronelli leads the race for quads. A mechanic works on a truck early on January 11, 2010 before the 9th stage of the Dakar 2010, between Copiapo and La Serana, Chile. France's Cyril Despres leads the race in moto, Spain's Carlos Sainz in auto, Russia's Vladimir Chagin in trucks and Argentina's Marcos Patronelli leads the race in quads. France's Stephane Peterhansel in his BMW glides past a road sign during the 7th stage of the Dakar 2010, between Iquique and Antofagasta, Chile, on January 8, 2010. Italy's Silvia Giannetti falls from her KTM during the 5th stage of the Dakar 2010 between Copiapo and Antofagasta, Chile, on January 6, 2010. Spain's Gerard Farres Guell kicks up sand with his Aprilia during the 4th stage of the Dakar 2010 between Fiambala, Argentina, and Copiapo, Chile on January 5, 2010. Spain's Marc Coma won the stage, France's David Casteu took second place and France's Cyril Despres third. Chile's Francisco Lopez Contardo guides his Aprilia through water during Stage 1 of the Dakar 2010 between Colon and Cordoba, Argentina, on January 2, 2010. Poland's Krzysztof Holowczyc in his Nissan passes race fans on a hillside during the Dakar 2010 between Colon and Cordoba, Argentina, on January 2, 2010. A KTM mechanic works on Spain's Manuel Garcia's motorcycle during the resting day of the Dakar 2010, in Antofagasta, Chile, on January 9, 2010. Spanish KTM rider Jordi Viladoms greets onlookers during the opening presentation of the Dakar 2010 on January 1, 2010 in Buenos Aires. A rider climbs a riffled sand dune during the seventh stage of the Dakar Rally between Iquique and Antofagasta, Chile, Friday, Jan. 8, 2010. Spain's Carlos Sainz steers his Volkswagen during the 8th stage of the Dakar 2010, between Antofagasta and Copiapo, Chile, on January 10, 2010. 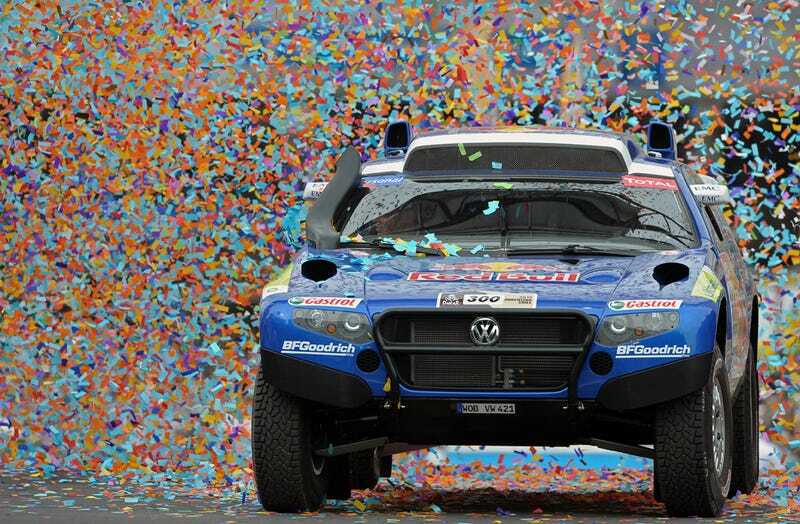 France's Stephane Peterhansel won the stage, Sainz took the second place and is still leading the race and America's Mark Miller took third place. Russian BMW driver Leonid Novitskiy and German co-driver Andreas Schulz try to escape after becoming stuck in the sand during the 8th stage of the Dakar 2010, between Antofagasta and Copiapo, Chile, on January 10, 2010. South African Giniel De Villiers drives his Volkswagen during the 8th stage of the Dakar 2010, between Antofagasta and Copiapo, Chile, on January 10, 2010. An aerial view shows the site where a Robinson 44 helicopter crashed in Fiambala, Catamarca province, January 4, 2010. The pilot, co-pilot and two reporters who were following the Dakar Rally sustained injuries when their helicopter crashed, local media reported. Manuel Jamett of Chile climbs a rocky road on his Yamaha motorcycle during the sixth stage of the Dakar Rally 2010 from Antofagasta to Iquique January 7, 2010. Mechanics work on vehicles early on January 11, 2010 before the 9th stage of the Dakar 2010, between Copiapo and La Serana, Chile. France's Cyril Despres leads the race in moto, Spain's Carlos Sainz in auto, Russia's Vladimir Chagin in trucks and Argentina's Marcos Patronelli leads the race for quads. Aprilia rider Chile's Francisco Lopez Contardo prepares his tent after the 5th stage of the Argentina-Chile Dakar Rally 2010 between Copiapo and Antofagasta in Chile, Wednesday, Jan. 6, 2010. Frans Verhoeven of the Netherlands rides his BMW during the 11th stage of the Dakar 2010, between Santiago, Chile and San Juan, Argentina on January 13, 2010. Frans Verhoeven of the Netherlands won the stage, US Jonah Street took the second place and France's Alain Duclos finished third.